Compare Car Sound Exhaust’s catalytic converters with any other manufacturer and you’ll see why Car Sound has become a leader in the manufacturing of exhaust components. Others may employ one or two of the following features, but only Car Sound puts them all together to create a catalytic converter that exceeds basic need and function. Years of research and development have resulted in many unique features that are exclusive to Car Sound. Car Sound combines efficient manufacturing techniques and state-of-the-art industrial design to produce an end process and product that sets, rather than meets, the highest standards of product performance and efficiency in the industry. Car Sound converters start with quality materials. 16 gauge 409 stainless steel is used for the converter body and inlet/outlet necks. 409 stainless steel is easily formed to the converter body designs and withstands the constant high operating temperatures and stresses of rapid quenching from road moisture. Car Sound’s 409 stainless steel body and necks will not rust and are covered by a 5 year/25,000 mile warranty against manufacturer defects. Car Sound Exhaust uses a high flow monolithic honeycomb catalyst. The ceramic is designed for maximum flow and surface area. The coating method is controlled to maintain exact specifications. An improper coating could result in flow restrictions or an emission test failure. The catalyst we use is a combination of rhodium plus platinum or palladium, vs. a palladium only catalyst. This combination coating is formulated to effectively reduce emissions on both early and late model vehicles. A palladium only catalyst has proven to be effective on some later model vehicles with computers with a narrowed emission window. Moreover, palladium only catalysts are not as effective on vehicles without computers that have a wider emission window. 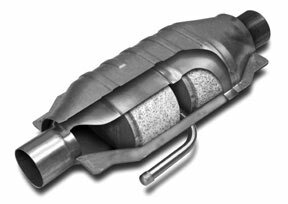 Car Sound catalytic converters are the perfect choice for those looking for the best possible gains from their JDM header and exhaust systems.